The IIC congress was held in 15-19 September at Queen Elizabeth II Conference Centre in London. The main theme of the Congress was “Conservation and Access”. Various ideas, surveys and practical examples were given on transportation and handling of cultural assets, disclosure and management of easily damaged materials, and information was exchanged. 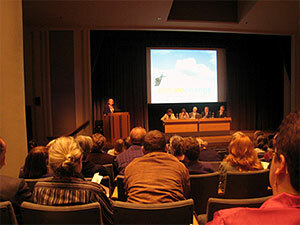 A symposium entitled “Climate Change and Museum Collections” took place during the congress. Changes in environment due to global warming and consequent effects on cultural assets were discussed. In addition, representatives of the organizations in each country referred to as IIC Regional Groups held a meeting. Ms. SONODA of the National Museum of Ethnology and Mr. ISHIZAKI of our Institute from Japan attended. Strengthening of collaboration between the organizations in each country was discussed.